Start by selecting the GluVue link or icon in your patient's EHR chart to open the custom viewer for glucose data. This tool can be used for patients using CGM at home or in the hospital, but is also useful for anyone who has glucose related issues and relevant data in the EHR. At the top left screen you can define nighttime hours for your patient. By default, nighttime hours are set from 10 PM to 6 AM. 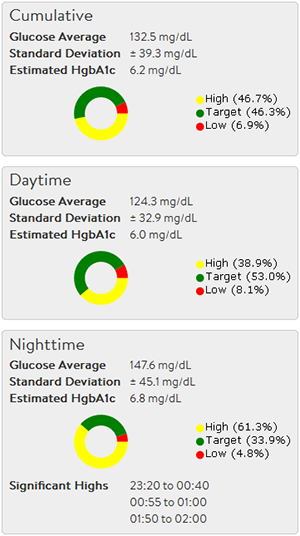 Use the Target toggle bar to define your target blood glucose range for your patient. The default target range is from 80 mg/dL to 130 mg/dL. These parameters can be toggled at any time. In the dashboard the target range is displayed in green, with high levels shown in yellow and lows shown in red. Nighttime hours are shown as a shaded area in the graphs. Confirm your lookback duration (we recommend 2 weeks), and view the Overview graph at the very top. Use this glucose-as-a-function of date plot to see an overall trend of the patient's glucose levels for the given date range. The Overview is also useful to quickly assess which dates may have no data available, which may affect how you interpret the visualized trends. The Modal-Day graph shows all available blood glucose values as a function of time overlapped into a single modal day. Days of the week have unique colors to help identify trends that may be specific to activities/patterns that are present only on certain days. You can click on days in the legend to subtract them from the Modal-Day view to further assist in identifying trends. Note that toggling days on and off in this fashion will only affect the Modal-Day graph specifically and not the rest of the graphs or results in the rest of the dashboard. Just below the Modal-Day view is the Heatmap view that demonstrates overall blood glucose trends (orange is specific to hyperglycemia, and red to hypoglycemia). Darker areas in the plot represent significant patterns that have been detected within the current lookback duration. To the right of the Modal-Day view you can find up to three sections - Cumulative, Daytime, and Nighttime. Each of these sections contain various statistics based upon the overall timeframe, the selected daytime range, and the selected nighttime range, respectively. The Daytime and Nighttime sections will not display if there is no data available that falls within their timespan. The average glucose, including standard deviation, is displayed for each section. In addition, an estimated hemoglobin A1c (HgbA1c) is shown. Note that the equation currently used for estimated hemoglobin A1c has not been thoroughly validated. Next you will find a pie chart showing the percent of values that fall within, above, or below the target blood glucose range defined by the Target toggle bar for that section's given timespan. Finally, the Daytime and Nighttime sections will display any significant patterns of highs or lows found within their timespan if they are found.